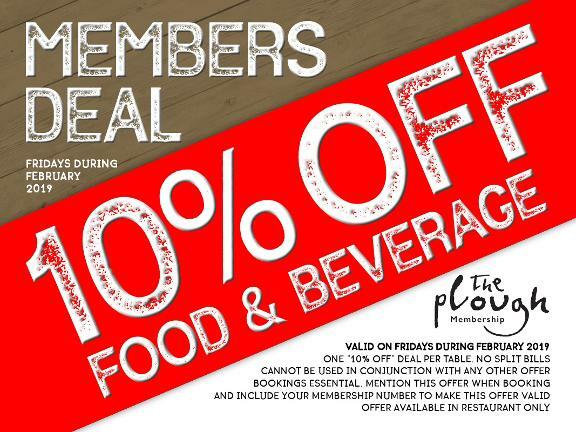 Once you become a member of The Plough, you are eligible for a voucher that offers 50% off (up to the value of $50). This voucher is valid two weeks prior to your birthday to two weeks after your birthday (except if your birthday is in January, where your voucher will be valid until 28 February). This voucher cannot be used in conjunction with any other offer, nor can it be redeemed for cash. Only one birthday voucher can be used for any one booking/table. If you have forgotten your Membership number, please contact us and we will send your Membership number to you. Valid on Fridays during February 2019. One “10% off” deal per table. No split bills. To be applied to the final bill, not individual purchases. Bookings essential. Mention this offer when booking and include your membership number to make this deal valid. Offer valid in Restaurant only.